The wait and see technique is well-known in football. 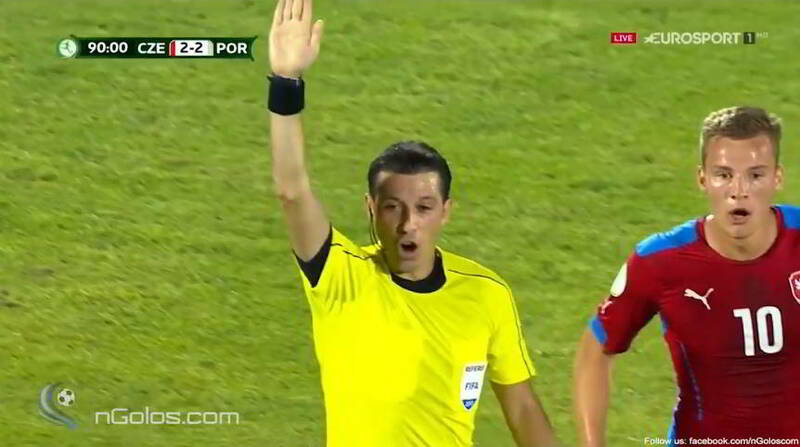 Assistant referees should not raise their flag too soon, but wait how play continues. 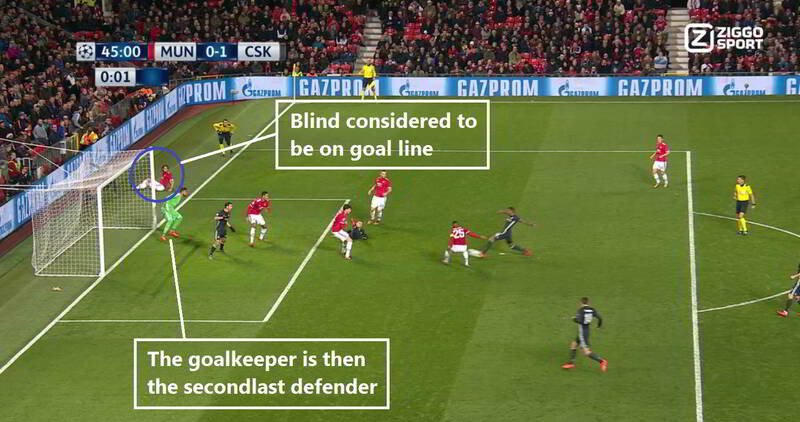 This blog post contains three great offside examples to show how it works. The first example comes from France in the 2018-2019 season. What is your first thought when seeing a situation like this below? Offside probably, but nothing is what it seems. Because when you have a clip of the full situation, you’ll notice that the player does not get involved in play. The player who passes the ball is the person who also touches it again. Biggest lesson here: have the courage to wait. The next situations are a a bit more tricky. See below. The second example is from a 2017-2018 Champions League game. 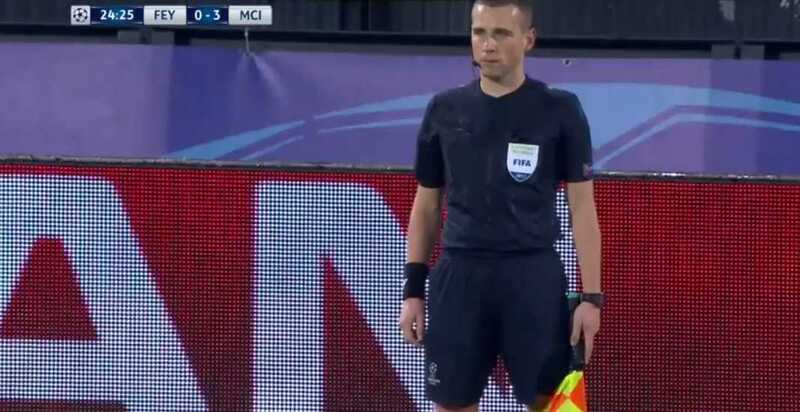 Feyenoord plays at home against Manchester City and the referee is Szymon Marciniak. 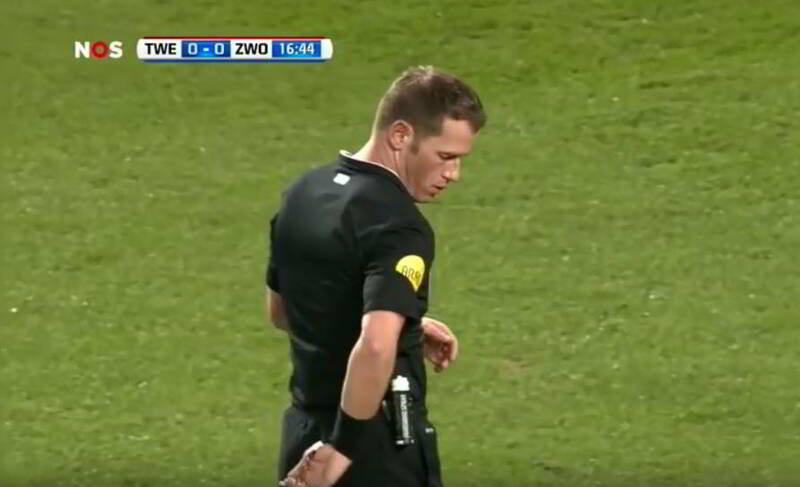 But I’d like to mention his assistant referee Tomasz Listkiewicz. I’ll analyse the situation below the video clip. The situation as it happened. Manchester City takes a corner kick and the ball does not get away. A Feyenoord defender blocks a shot from outside the box, but it’s not sufficient. There is a second shot on goal. As you can see, at the moment of the pass there is an attacker in offside position. That is what happens here if the player in offside position gains the advantage. But is that the fact here? And that is exactly what happens here. 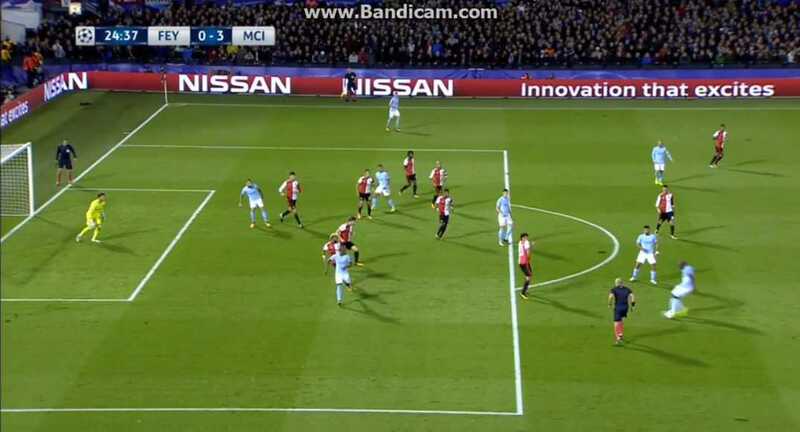 Although the player is in offside position, he is not active in play and does not interfere with an opponent. 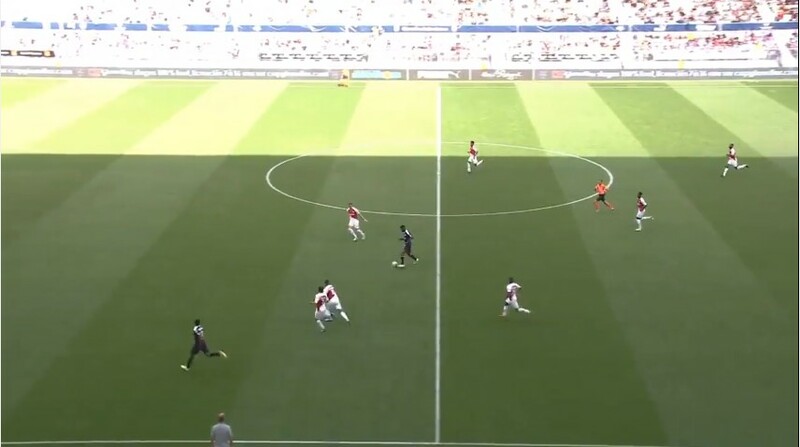 The assistant referee waits until someone touches the ball and that is an attacker who is not in offside position at the moment of the shot on goal. Great teamwork by the match officials and good use of the wait and see technique. I’d love to hear how they communicate in situations like this, because that makes it even more interesting. It gives us an even better idea how these calls are made. At the moment of the pass Van Wolfswinkel is clearly in offside position. But remember: being in an offside position is not a foul. And then something interesting happens. Van Wolfswinkel (red circle in pic below) runs towards the ball, but does not touch it. And that is the crucial detail to make the correct decision, because that’s important to determine if someone is interfering with play or an opponent. Van Wolfswinkel is running towards the ball, but that does not meet the criteria above. His actions don’t have an impact on the opponent. But he is the player who scores. What is in the LOTG about gaining advantage? I want to tell you something about gaining an advantage. But we forget one important thing. Is the other player in offside position? In the video you can see lines on the pitch. I’ve marked it purple below and you see the secondlast defender’s shoe is closer the goal-line. Gaining an advantage only applies when the ball rebounds from an opponent, crosbar,goalpost or match official. Or when a defender deliberately saves the ball. That’s not the case here. As a result, there is a new situation at the moment the right winger receives the ball. When the right winger passes the ball back to Van Wolfswinkel, he is behind the ball. Correct goal and great wait and see technique there. Do you remember any interesting situations like this? Let me know. Interfering with an opponent, what is that exactly? 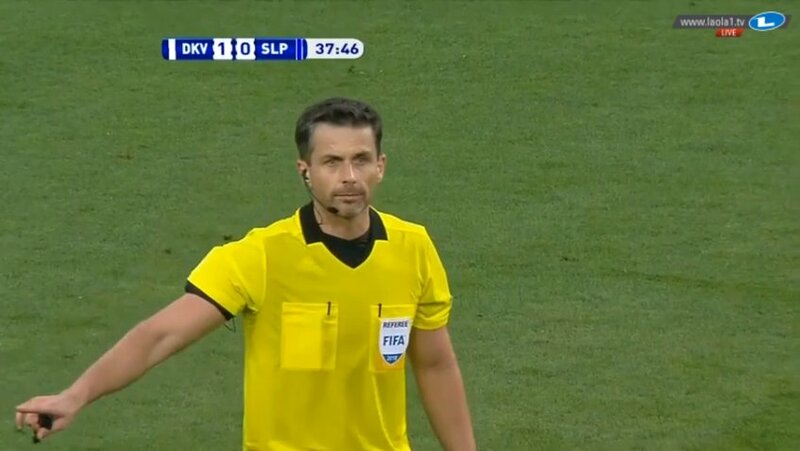 The Polish refereeing team made a great call you can learn from in their game between Dynamo Kyiv and Slavia Prague. At first glance the goal seems to count, but the refereeing team was making sure to get clear what happened. Who were involved? Who was in offside position? Below you can see the video of the match situation. But before you watch, try to write down the criteria for offside. Focus on interfering with an opponent. Below the video you’ll get an explanation, but it’s a good exercise to share your own thoughts first. You’ll notice the assistant referee moving away from the goal-line, because that is the signal a ball has crossed the line. But in the meantime referee Daniel Stefański keeps talking with assistant referee Dawid Igor Golis. 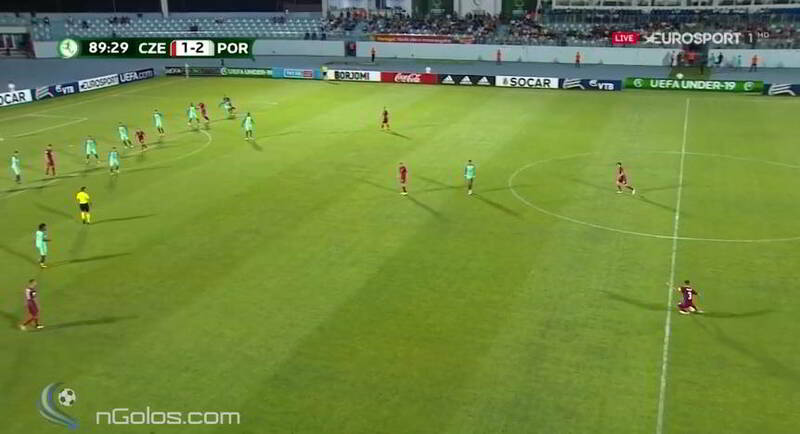 If you check the clip again, you’ll notice two players in an offside position. The goal scorer is not. The question now is: what is the role of the players in offside position? Do you know what the Laws of the Game say about this? The latter is crucial, because that is what blue attacker 19 does. At the moment of the pass he is in offside position. When he walks away from the goal-line he runs into a defender, who has no longer the chance to play the ball. So a great call by the refereeing team. Biggest lesson: always communicate as refereeing team. 5 summer holidays fitness tips. When the season is over you might want to relax, but don’t get too relaxed. Take a different approach, because that will get you in a different vibe. What I did right after the summer break? 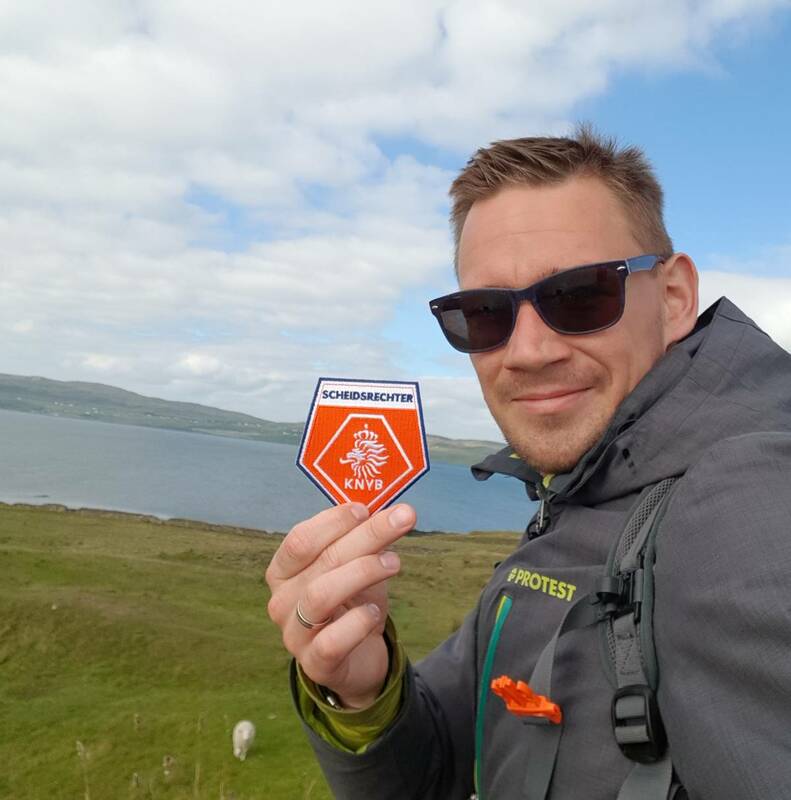 I did some walks on the Scottish island Skye and went to The Hague’s beach for stand up paddling. 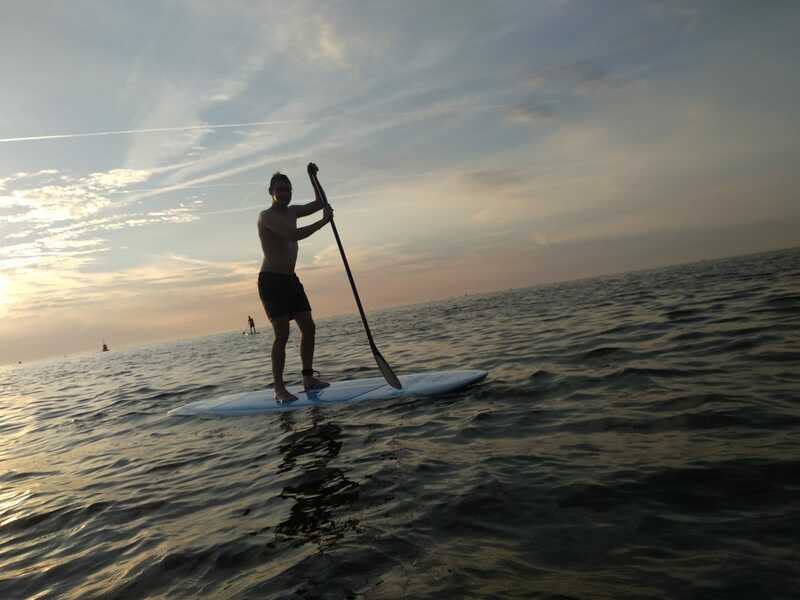 This s0-called supping is great fun and will also train lots of different muscles. 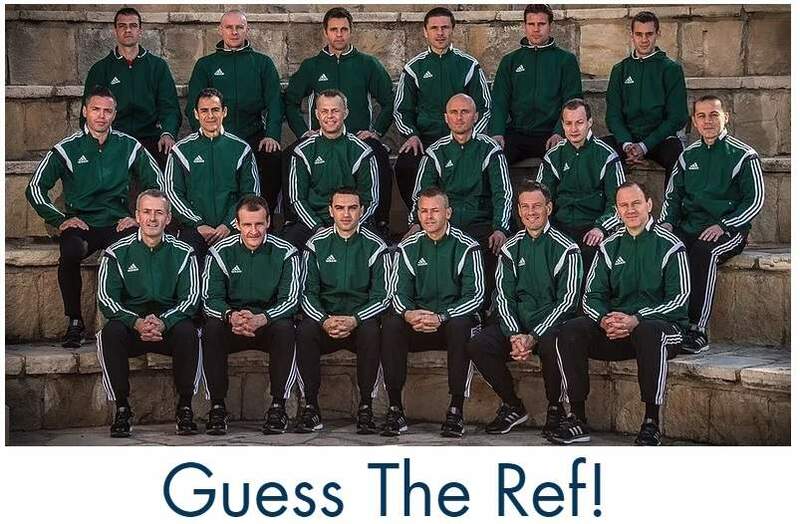 In this article you’ll get some great advice by fitness experts, like the Dutch pro referee fitness instructor. Here’s how to start with some excercises after a period of physical inactivity. Measure how you improve. You could weigh yourself after you came back from the holiday and set yourself a goal for the coming weeks. Another way to get statistics how your performance improves is time your runs and see how you get faster after each training session. Go back into excercising gradually. Don’t start with a heavy training session. Just give your body a chance to build up the strength. After a holiday it’s not used to the heavy training sessions from before the summer break anymore. Eat in moderation. Don’t continue with holiday excesses like overeating and drinking too much. Yeah, they are mostly always there. It’s good to have a few weeks of relaxation – don’t forget to take psychological rest -, but now is the time to get back in your physical routine. Don’t start with running immediately, do some other sports. It’s good for your body to do some other sports before you ease into running again. Go cycling, play some football yourself or ask some friends to do a tennis or squash game. That’s also the advice from referee fitness instructor Hilco de Boer. Because when you do other sports, you’ll give your mind a good rest and different thing to focus on. When you want to start training again, the start gradually with running with this pre-season tips for referees. Tips via Hilco de Boer, Run Washington, Lifestyle Asia and Slimforce. What do you do during the summer break? Please share it below. Deliberate handling or not? That is always an interesting discussion for tv pundits and players, but also for referees. What are the criteria for a deliberate handball? KNVB has made an interesting video with lots of examples, but I’d like you to do some homework first. Get a pen and paper. Write down as many things you know about deliberate handling, because that will help you discover the rules the best. Difficult isn’t it? How many bullet points do you have? Now check out the video of non-deliberate handling. Below the video you’ll get the explanation by the Laws of the Game. According to the KNVB all these examples are non-deliberate handling. But why? Check out what criteria are mentioned in the Laws of the Game on page 96. How many of these bullet points did you write down before watching the video? I hope you like these small exercises that will keep your LOTG knowledge on par. Want to test that on a weekly basis? Check out the LOTG Quizzes. Touching the ball twice at penalty kick: allowed or not? Kieran Dowell touching the ball twice at penalty kick this weekend. In the cup match against Arsenal. How would you handle in situations like this? And during last season a similar situationLeicester City got a penalty kick against Manchester City and Mahrez is the taker. He kicks the ball, but slips. 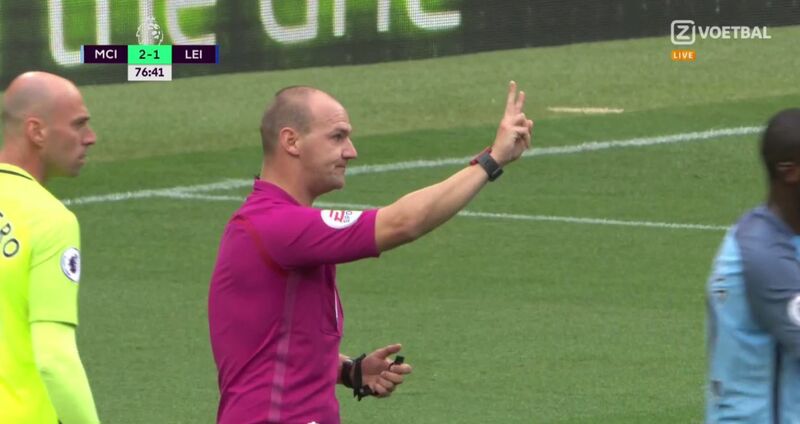 The goalie protests right away and referee Robert Madley makes a quick decision. He disallows the goal, because it’s not allowed to kick the ball again before a team-mate or opponent has touched the ball. Below another example plus an further explanation based on the Laws of the Game. And have a look at the situation below. There’s also a similar situation in the Serie A earlier this season. In the game between Sassuolo and AC Milan Bacca touches the ball twice, but I needed a few replays to see that. At first glance it’s difficult to see what exactly happens. But for the players on the pitch it was very clear. 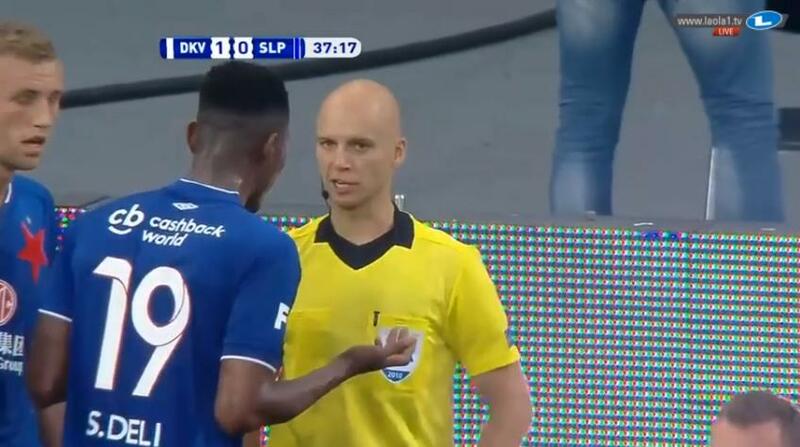 They immediately asked the referee if he had seen what they saw. Bacca’s left food slipped, so he could not take a proper kick. He shoots with his right foot, but can’t prevent it from touching his left foot as well before anyone else touches it. That extra touch gives the ball an extra spin, which puts it over the goalie, who is not able to touch the ball. Arbiter Café on Twitter got me a clip that I could embed on the blog. Much appreciated. Please have a look and see if you can spot Bacca touching the ball twice at penalty kick. Below the video you’ll find an explanation based on the Laws of the Game. Difficult to spot, right? Only the replays will give you a clear view of what happened. Referees have to focus on a lot of things during a penalty kick. They don’t want players or the goalie to move too quickly, but in the end not many referees whistle when it happens. Just wanted to know from you if referees should get more strict on encroachment. Vote in this Twitter poll. During lots of penalty kicks taken in professional leagues one or both teams are encroaching. Should referees get more strict on this? Want to read more? Check all case studies on my blog. A new case study: “Offside when defender leaves field of play”. 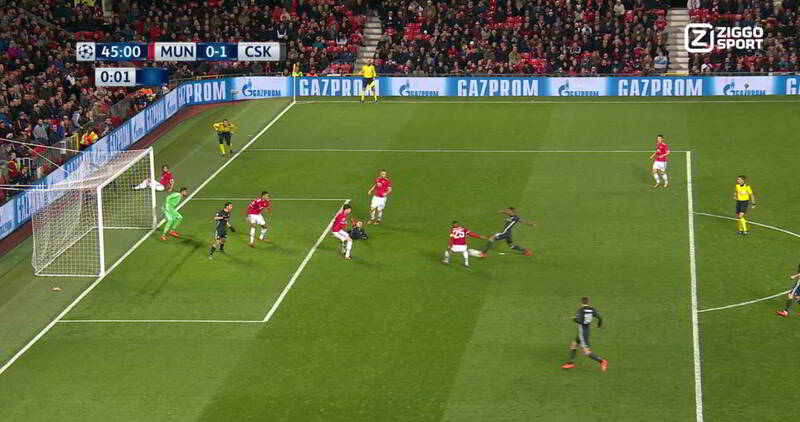 CSKA think they score a goal, but does it count? A screenshot from the situation. To give some extra info: the player in black right in front of the goalie touches the ball. And, still the same verdict? Defender leaves field of play: what do the LOTG say? The Laws of the Game are very clear on how to handle in these situations, but did you know this? And the LOTG also add. “If the player left the field of play deliberately, the player must be cautioned when the ball is next out of play.” In this situation the yellow card doesn’t apply, because Blind went out of play in action.